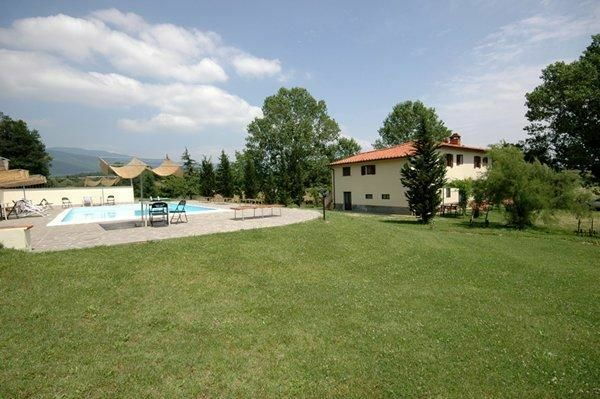 Nice complex comprising several apartments situated in quiet location at the foot of Pratomagno, in the countryside surrounding Arezzo. On the premises there is a small nice lake and a beautiful botanic park offering century-old trees and plants from all over the world, which offers an ideal terrain for nice walks. All of the apartments are simple furnished in a rustic style. The apartments Valcellino 2, 3 and 6 are close to one another while Valcellino 7 is in an old hamlet overlooking a beautiful valley. Distances: food shop approx. 500 m away, the small town of Terranuova Bracciolini with all kinds of shops 3 km, Montevarchi 7 km, Arezzo 25 km, Florence 45 km, Siena 55 km. The access to the property is via an unpaved but well-maintained road. At guests’ disposal: furnished garden, swimming-pool (12 x 6 m – maximum depth 1,05 m – open from 01/06 to 30/09) with solarium area, private furnished gazebo for each apartment, 4 bikes available. The apartment Valcellino 3, 6 and 7 are provided with a washing-machine and ironing facilities, while Valcellino 2 has access to an outdoor laundry set on the ground floor to be shared with another apartment. Parking within the grounds. Extra service: maid service available by arrangement at € 10, - / per hour to be paid on the spot. Baby bed available on request. 1st floor: entrance, living-room (TV) with dining area, fireplace and kitchen corner (microwaves), double bedroom, twin-bedded room, bathroom with shower. Additional costs paid on site: Security deposit: € 150,-Final cleaning: € 30,-Heating: according to consumption.